René Cassin » Sign up for Human Rights Shabbat 5778! 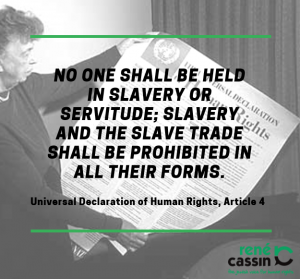 René Cassin // Campaigns // Slavery and Trafficking // Sign up for Human Rights Shabbat 5778! This year’s Human Rights Shabbat is on the 8th and 9th of December, events can happen over that Shabbat and in the week leading up to it. Last year was our biggest ever Human Rights Shabbat and this year we are aiming to reach even more Jewish communities. René Cassin has been running the Human Rights Shabbat Programme for the past nine years. You can have a look at previous resources on our website. This year we are building on our theme from last year of modern day slavery. You can sign your community, youth movement, J-SOC or school up to Human Rights Shabbat 5778 today! To sign up and receive further information, simply send an email to sam.grant@renecassin.org and register your interest and appoint a primary point of contact within your community. You can check out last year’s Human Rights Shabbat materials here.